As winter bites back and the country is gripped once more by sub-zero temperatures, we felt that Frederick Charles Herrick’s design, ‘It is warmer below’, was the perfect choice for our poster of the week. The Underground has always provided shelter from the elements. 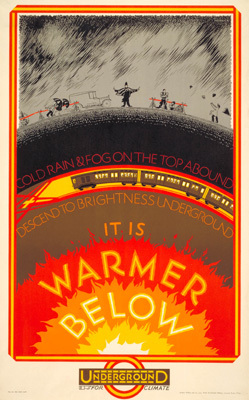 Created in 1927 during a particularly harsh winter, this poster, with its bright colour contrasts and jaunty message, served as a warming reminder of the benefits of travelling underground. The winter of 1927 brought Christmas blizzards from Kent to Cornwall and a return to wintery conditions in mid-march that can be likened to the present cold snap. Herrick’s approach to design was unique and the posters that he created for the Underground were some of his most distinctive. He often appealed to the senses when presenting the service as comfortable and efficient, operating beyond the constraints of traffic, road works and the weather. In this example the physical benefits of a subterranean climate, as predictable and constant, are compared favourably with the unpredictable British weather above. In summer this poster was replaced with its seasonal equivalent carrying the message ‘It is cooler below’.